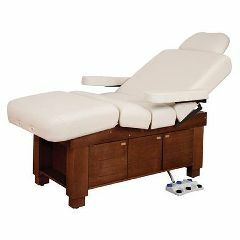 This unique Spa Table has become the top choice table for Spas in the world due to its simplicity and functionally. Featuring Oakworks unique 4 electric motor system and electric salon top, the guest experience is unparalleled. The clean lines foster a sense of elegant simplicity, while the custom designed cabinetry, complete with four electrical outlets inside the cabinet, adds a functionality that makes incorporating a hot towel cabi a convenient reality. Therefore, it should come as no surprise that Clodagh has designed countless spas with these same ideals in mind, always striving for the perfect blend of form and function, finding a formula that is equal parts purpose and art. The versatile Electric Salon Top is the perfect option for those who want the full functionality of a completely electric table. You never need to struggle to properly position a client again, because the electric salon top does most of the work for you. The Electric Salon Top features our patented access design, created to improve the ergonomics of the therapists while working in a seated position. The seat section features our super high density lower foam layer to prevent bottoming out and the extra length in the seat insures that every guest is comfortably supported. Optional armrests are a smart choice for this top; giving the table the feel of a comfortable recliner and making your clients feel as relaxed in your office as they would in their own living room. And thanks to the stabilizing linkage system, the armrests adjust automatically, ensuring level support no matter what the position of the backrest. This keeps the client's arms level and in a comfortable position. Length: 73" Padding: Aero Cel System 4"